I’m not at the American Planning Association’s annual meeting in Chicago! I wish I were (and yes, it would involve many a scene like the one pictured above). Here are some of the reasons why! I ran for and have been elected the Secretary-Treasurer of the APA‘s Technology Division. I have taken an interest in their work since I became a member of the APA and started attending the annual meetings when I started my planning degree, and take office in this position formally at the Technology Division’s business meeting (which was held on April 14). I’m looking forward to working with the rest of the executive committee on projects involving planners interested in technology, as well as learning more about the experiences and interests of other members! My statement as part of the nomination process is still online if you are curious. Earlier I mentioned the APA’s annual meeting. I’m pleased that this year’s event in Chicago will be featuring an unconference on Intelligent Cities on Wednesday, April 17, as well as a session on Civic Hacking (hashtag: #hackAPA) with many of the interesting people working and thinking at the intersection of urban planning and the potential of online tools for organizing, participating, and making things happen. This is a hugely important conversation for planners to be involved in and I’m stoked to see an opportunity for planners to be leading the discussion, as I feel planners have important contributions to make around technology and the broader intents and impacts of policy. The unconference organizers are to be praised for opening up the conversation to non-conference attendees — something I find incredibly important given the misconceptions surrounding what planning does, how it does it, what it should be for, and how technologies will and ought to figure in all this. Although I’m not able to attend the event in Chicago, I’ve taken a gander at the ideas that have been proposed and voted for the sessions highlight conversations I think need to hapen. As of Monday, there are 18 ideas on the site to lend support for some topics that I think matter. I encourage you to do the same! The session proposals are a quick skim and I think it will be interesting for those in room to get a sense of what those who couldn’t make it are thinking about. Having facilitated a couple, attended a few, and thought a lot about unconferences — all of which had their own unique style, approach and cultures to consider in adapting Harrison Owen’s Open Space method — I thought I’d share a few quick tips and thoughts for those attending the unconference, especially since it is loosely affiliated with the annual meeting, a very different kind of event. See the diversity as an opportunity. Hopefully, the unconference gives you a chance or an excuse to get to know people from a diversity of backgrounds who hold different views and have different experiences. Embrace it! Diversity is an unconference’s strength. The people in attendance have illustrated that they’re interested in the topic enough to attend and share their time — dig in! You may be surprised where you might find support or refinement for your ideas. Turn your curiousity up to 11. The topic is definitely one on which strong views might be held. It is all too easy for us to make the assumption that views we disagree with are rooted in ignorance, misunderstanding, or ideology. As a prof teaching me intercultural communication once advised, “Turn your judgment into curiosity.” There are lots of things to question. Identify expressions of dissent in your conversation and make room for them — amplify them, even, and thank the people who have the courage to put it forth respectfully. Chances are good for every one person who has the strength to voice disagreement, there are a number of people who agree with it in whole or part. Look for common ground. There’s often a lot of focus on positions — things we want — with much less interest in why we want them. Respect the expertise of everyone in the room. It may mean it takes longer to figure out if the perspectives lend themselves to concrete action that you can offer once the unconference is over. Hanging on to that common ground is vital, especially if you think your follow-up will involve collaborating with people at a disance. Have fun! Unconferences get their energy in much the same way cities do — by acknowledging the role that everyone has in creating an informative environment. This is not directly related to the conference but if I were at the discussion on Intelligent Cities, it is doubtless I would make mention of this book at least once. I penned a brief, 500-word review of Evgeny Morozov’s To Save Everything, Click Here: The Folly of Technological Solutionism for the Division’s most recent newsletter. Since the Division is in the midst of shifting gears on its web presence, I will re-post my review here on my blog. With any luck, I will get to expand on my thoughts on that article here on blog in the future as well. One criticism of Morozov (mostly these tweets from Alex Steffen) is that he doesn’t go far enough to suggest alternatives or be generative in pointing the way towards action. Morozov has responded in the past to this critique (although I’m not able to find a citation for it, curses!) by saying that it’s not his job. His job, as he appears to see it, is to point out the weaknesses and failures associated with the outcomes of the thinking he criticizes (and to do so in ways that are accessible and which engage with the broader history of human scholarship and knowledge), not to reform the system by ensuring it appropriately internalizes it into action going forward. The book is perhaps thin on prescriptions for action if compared with a book like, say, Jack Manno’s treatise on the effect of commoditization, Privileged Goods. I think the main effect of making concrete suggestions is that it makes people zoom in on the content of the prescribed action, rather than the process of considering and assimilating the ideas. In short, Morozov would undo his own argument against solutionism if he described technology outcomes in any kind of concrete fashion. He does highlight examples of processes that lead to outcomes that he respects (such as adversarial design). Since I first wrote my previous post describing my reactions and thoughts on Uber, the topic has since, as expected, exploded — both across the continent and here in Vancouver. Uber itself has stoked this fire. Since Uber’s business model makes it technically a limousine service, the Passenger Transport Board is requiring it to charge $75 per ride minimum as per the way the board classifies the types of trips being served by Uber and contends it is a transport company, which Uber disagrees with. 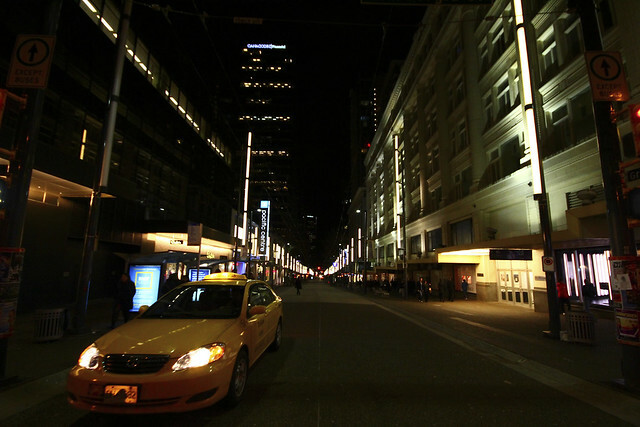 Uber has encouraged its users here in Vancouver to bombard the Passenger Transport Board (which regulates taxi and limo rates and license policies), Mary Polak, the Minister of Transport, and Vancouver Mayor Gregor Robertson with social media condemnation. Earlier this week, David Eaves offered his thoughts to the Passenger Transportation Board through a thoughtful blog post that broke down some of the pros and cons of the minister’s response, and what cities have to gain with the experience Uber offers. He linked to my post saying that I don’t make the case for not letting Uber into the market — and since I don’t think I intended to (though I admit it may not read that way), I don’t feel bad that I failed in that regard. What I had mostly hoped to argue for was some measure of thoughtfulness about the complexity of the situation. Uber and its supporters have got a position and they’re sticking to it — that any body that deems to regulate its services is corrupt, engaging in privileged protectionism of taxi and limo companies to the detriment of innovation, and that this is an injustice to consumers who are being gouged with inefficient, pricy and poor service. They’ve insisted upon a David and Goliath reading in which Uber and the customers are the victims and the only thing that is satisfactory is a return to the way when Uber, frankly, was operating completely off the radar. Granted, they did so with drivers already working for companies that, we assume, were licensed. Having never worked or interacted with them directly outside of Twitter, the Ministry of Transport does not have a reputation amongst the urban transportation advocates I’ve been in contact with as the most, shall we say, with it of bodies. So their main mode of responding to the deluge was a somewhat cold and sterile press release statement that made some allusions of collaboration with Uber. This happens to feed right into the way Uber would prefer us to see things — a faceless bureaucracy that doesn’t care about you and I or our transportation challenges. Fault me for not being too cynical about the board’s motives, but it looks to me more like the Ministry and the PTB were blindsided by a company that (and this part is ambiguous) never seemed to try to engage it in good faith or did anything but start yelling about being a victim. I don’t have a position. As I said at the end of my last piece, I don’t pretend to know how this should all play out. But I also categorically reject the way Uber is framing this situation, because they have something to gain from it, such as an angry raging public to do their bidding to strongarm regulators into doing something that may privilege Uber at the expense of a benefit we actually might kinda like. That said, my interest — and what I hope others’ interest should be too — is in seeing policy developed that allows innovations in service delivery (such as Uber) to work in the space with some adequate consideration for the reasons the industry is regulated, of which the price is an important factor among many. Some participants in the conversation on Twitter have brought these up, such as issues of safety, inspection of cars, distribution of costs and benefits, and the opinions of the people employed in the industry. A recent Vancouver Courier story on the subject includes statements from the director of the Passenger Transportation Board and Uber’s Vancouver manager, and seems to reinforce the story being told by Uber rather than shedding light on the nature of those considerations. That’s disappointing but befitting a process that has never been transparent. Jan Broocke, the director of PTB, alluded to the fact that the pricing was decided as recently as July 2011 and agreed upon by the limo industry. In transport policy time, this is considered recent. Some similar companies as Uber have run into the same roadblocks, and have chosen to approach it differently, as this piece by Brian X. Chen in the New York Times briefly describes. This reinforce my points — the way this story is being framed is not the only way possible, and far from the only valid one. That being said, the truth and the way forward likely incorporates a little bit of all approaches. To speak to that, I want to emphasize that I am NOT saying that taxi companies should not be subject to competition. I am NOT in favour of making things unduly difficult for companies doing heretofore difficult/impossible things with technology to improve the experience. And I certainly don’t think that the poor quality of taxi service or the transportation system in Vancouver more broadly (since some have tried to bring the scarcity of late night transit into this discussion) is something we shouldn’t be frustrated and willing to speak up about. For the benefit of those who might not know me or where I’m coming from, I advocate for public transit as a volunteer with the Vancouver Public Space Network and am getting a master’s in planning with a focus on transportation and study the interaction of society and technology. So I’m curious and passionate about the experience of urban mobility and issues of access, and have written elsewhere on the topic. I don’t have a position. Instead, I am deeply interested that the public as a whole get a policy that works for all of us — those employed by the taxi and limo industries, consumers of varying stripes (i.e. not just those of us with smartphones or money for taxis as they operate right now), and I’m far from satisfied by only one side’s story on the costs, risks and benefits. TonightOn September 25th, the fine folks at Spacing Magazine will celebrated the launch of the latest issue of Spacing Magazine. As Spacing has done since last year, they publish one two national issues a year with contributions from cities across Canada. I am grateful that the editors extended to me an opportunity to contribute, alongside three other knowledgeable local movers and shakers, a brief piece about some of the strengths and challenges related to (in my case) Vancouver’s transportation system. For those familiar with Vancouver, most of what I wrote will seem pretty obvious, as I was glossing over for a 200 word piece, but for the purposes of painting a picture for national audience, I hope it gives an effective summary of transportation now and in the near future. This was completed, of course, before TransLink started their draft base plan consultation for 2013, but much of what we have seen from that process further emphasizes the points I made in my Spacing piece (and in my post here last week) about the challenges we have for expanding (and in many cases, maintaining) high quality transit service throughout the region. I’m hoping I’ll get to grab a copy soon to read the rest of it! Here’s a list of stores in Canada that carry Spacing if you want to get your hands on it as well. The big story for yesterday was TransLink unveiling their draft 2013 base plan (which TransLink is bringing out for public consultation starting September 20). The gist of it is this: because Christy Clark’s BC government scuttled the Mayor’s Council proposals for drumming up the funds to maintain and expand existing transit services, TransLink is having to make the hard calls on what will go forward and what it can’t afford to grow or keep around. TransLink’s Buzzer blog, Stephen Rees, Civic Surrey and Vancouver Observer go into much greater depth on the implications of this plan. Thankfully, we’ll still see the Evergreen Line rapid transit being built in Coquitlam, and a B-Line express bus service (though much curtailed) will still make its way to Surrey. The poll found 60.3 per cent of those surveyed oppose Gateway, while 49.9 per cent oppose plans by Kinder Morgan to twin its Trans Mountain system, a half-century-old pipe that already carries substantial volumes of Alberta oil to Burnaby, B.C. On the surface, these stories seem to have little to do with each other — even though the pipeline story has become a lightning rod for a whole host of issues, from the future of resource-based economy in BC, to the division of oil pipeline revenues versus who assumes the risk of handling potential oil spills, and the perceived meddling of the Federal government with environmental assessment and protection safeguards, climate policy and scientific due process. Isn’t the story of public transit being underfunded in Vancouver just this region catching up to the public transit story for pretty much all of North America? When will we reach the tipping point where it will be considered safe for a political leader to authorize sustainable funding for public transit? Or will we ever reach that point again? For now, many are convinced we’re not there, hence the mania for auditing TransLink, as though that will miraculously yield enough bus loaves and fishes to feed transit to the multitudes. It’s not going to happen. […] TransLink needs to be more efficient. It needs to be policed by people who aren’t double-dipping. It needs to regain trust with voters. But after all that, it’s still going to need new funding to properly maintain, service and upgrade transportation infrastructure in Metro Vancouver. Much of the public chatter about TransLink reminds me of the joke about what men really mean when talking to women. According to Langley-based Jordan Bateman of the Canadian Taxpayers’ Federation (what is that, anyway? ), most people think transit is a good idea for their friends and neighbours but not for them, so they don’t want to pay for it. That’s the message that caused Premier Christy Clark to kick aside, without any consultation or negotiation, a painfully crafted proposal to approve a vehicle levy to keep transit moving and improving. The angle that ties these two things together is the one that considers the economics of generational shift. (Gordon Price has been keeping tabs on the issue of the generational shift at Price Tags.) Interestingly, the pipeline poll showed concerns about the pipeline to be second only to those about the economy. What is transit for or about if it’s not the economy? In the places where it works, transit costs about the same, in the long-term, if not less, than paying for a tonne of metal that depreciates the moment you take it off the lot, along with the gas, maintenancea and insurance it runs on. That means it frees up money for people to spend on goods, services and experiences — which often results in more jobs. Decision-makers are framing problems according to concerns of the past, not problems of the present or future. Yesterday’s economy relied on people building cars and choosing to live in places that depended on them. The people buying houses don’t want to spend their lives in — or their livelihoods on — their cars. It’s well-documented that people across the continent are driving less, putting off getting their licenses, and choosing to live near transit. Go ahead and call us “The Cheapest Generation,” like the Atlantic Magazine did last month. But dig a little deeper. Who will bear the ill effects of altered climate resulting in extreme weather events becoming more common? Those being born now, and their children. Who will have to live with the social effects of an underdeveloped transit system, congestion and sprawled development patterns? Youth and children. Thinking of the concerns about the pipeline, who would have to foot the long-term costs of restoring and pay the price of not being able to enjoy affected ecosystems, should oil spills damage BC’s coast? Taxpayers of the future. And don’t forget the realities of the demographic shift and its implications on income and pensions. Cheap’s looking pretty smart for a whole bunch of good reasons. This is a powerful transitional time on the local, national and international arenas, as the developed world comes to grips with our understanding of what we value and what we want out of the good life. We’re also in the awkward position of having to figure out how to correctly price the impact of a car-based lifestyle, while creating alternatives that actually work. It’s uncomfortable and unsettling — but will be even more so if it doesn’t happen at all. [..T]he question becomes: When does “someone else’s transit” become “my transit, my way of getting around,” or something that benefits me – not just my friends and neighbours? When will enough voters view transit as being in their interest? When will enough voters view transit as being part of their legacy? This past weekend, I attended the Digital Storytelling Unconference at New Westminster’s River Market. In the morning pitch session, I introduced myself, then said I was very glad to hear that the Unconference was being held in New Westminster, and attributed to the revitalization of the Quay and its market as a phenomenon rooted in storytelling, and thus a very appropriate venue for the conference. My session was scheduled for the end of the day. There was a ton of good discussion, but I probably glossed over a few things that could have used a bit more explaining. I attempted to start with a video about Participatory Chinatown, a game from Emerson College’s Engagement Lab which allowed people to get to know the lives of people living in Boston’s Chinatown, and wove it into discussions about the neighbourhood’s future. It’s an intriguing example of game dynamics being applied for the task of envisioning the development of a neighbourhood. I then showed the website Disappearing Main Street. I think I mentioned that I have some mixed feelings about the project. In spite of that, it still strikes me as a great example of the kinds of stories we are able to now tell, where previously it might have taken a lot longer and reached a lot fewer people compared to being online now. I put this in the same vein as the interest in hyperlocal news, which I recall someone remarking on during the session as a “failed promise” of some sort. My opinion is that even if those early experiments didn’t pan out, I don’t think we’re seeing the desire to use our online tools for bettering and improving our understanding of our immediate surroundings; just that those experiments are still continuing to find their footing. Aside from the technical plumbing questions of what data is available (although those are all very important), I am fascinated by digital storytelling for cooperation and coordination on either responding to urban issues or creating new things altogether. (Frankly, that’s probably been the thread tying together most of my obsessions since I started my undergraduate thesis on Toronto Transit Camp.) What I think is interesting is that planning is the existing institution with which we have traditionally addressed these issues (and for which we have a lot of language for describing the trajectory of change we want to see). What the tools for cooperation and collaboration allow us to do is scale up that conversation, although it doesn’t necessarily give us any shortcuts in understanding how, precisely, to work with each other on things we care about. That last bit of work still happens through the stories, and for that we need safe spaces to bring who we are into those tales. And, ways to find our interested audiences. What I lacked the cohesiveness to say is how digital storytelling is becoming symbiotic with the act of placemaking. We can see this when we see that the most common question on a city’s Reddit board is often some variation of, “I’m in town for / I will be moving to your city in a day / a week / a month, where should I live / what should I do while I’m here?” I see the footprints we leave in the digital cloud (your Foursquare check-in today, your local restaurant review tomorrow) taking on the digital equivalent of foot impressions in wet concrete, our individuated marks in the informational infrastructure. During the last part of the session, I brought up This Is Our Stop, which was kind of fun because both Denim and Steel‘s Todd Sieling and I were in the room, so I was able to speak to some of what I had when I came up with the idea (such as connecting with people sharing an experience of space and service, across time), and Todd was able to speak to how people have actually used This Is Our Stop (as well as how it has been received by TransLink and how it has fared in its incarnations in other cities). As I’ve blogged before, I think there’s a great deal of wisdom behind the way TIOS was implemented, as an extension of the somewhat fleeting experience of interacting with strangers at a bus stop. Just because our digital tools can do certain things in exchange for hooking up with our identities in other systems, doesn’t mean it should or would be particularly beneficial. As an aside, I did mention that, in my opinion, This Is Our Stop strikes me as one of the more intriguing and interesting uses of TransLink’s GTFS service data, and I haven’t been aware of too many others (either specific to TransLink or from other transit agencies) aside from mobile scheduling applications. TransLink is holding a developer camp on Wednesday, July 18th (no additional information out of TransLink’s Buzzer blog aside from a brief mention) for app developers interested in working with TransLink’s API, as part of its I Love Transit week activities. Those interested in keeping abreast, TransLink has a Google Group for their API developers. Reading Raul’s blog post on the value of storytelling reminds me of something I had wanted but didn’t get to bring up in the session: why stories for policy? Aren’t the big decisions of government too important to worry about the stories or one or two or ten people? For those who argue for the use of dialogue in policy decision-making, stories have everything to do with who’s telling them. The issues at hand are often so complex that stories end up to be the primary way by which we understand why people think certain things — such as what the most pressing parts of an issue are, what the causes of those issues are, and what effects result from those issues. To take an example from urban planning, affordable housing is a huge issue affecting large swaths of the people living and who want to live in Vancouver; but how are questions of what gets built affected by our stated goals, such as compact development, transit-oriented development, or access to greenspace? What are we willing to trade off on, and who wins and loses when we decide that (or if we don’t decide at all)? Since the conference I’ve stumbled on yet another interesting experiment in this space, this one also by TransLink: the Buzzer Blog is doing a series of blog posts on the topics of planning for the future. I really have to applaud them on highlighting the tradeoffs inherent in the activities that further TransLink’s goals. Even though, as one commenter put it, there is a sense of, “How does us knowing or talking about this change anything?” the fact is that systems have stories too, and even the largest, most powerful individuals or entities in the region influence that story at best; they don’t have the singular ability to write it. About three years ago, prior to entering UBC’s School of Community and Regional Planning, I had a chance to attend a demonstration of the co-design method pioneered by architect Stanley King. This article will give a brief rundown of the major activities involved in a co-design process, This will be followed by some links to other resources about co-design, examples of projects that have used the co-design method, and how King is moving forward with integrating co-design methods into current work. Broadly speaking, co-design brings members of the public together with artist-facilitators to dialogue and collaboratively produce a community vision. These visions can guide and inform planning and design activities as a project unfolds. Stanley King has been using this method with communities since 1971 through The Co-Design Group, an informal association of architects, designers and researchers based in western Canada. The bulk of these activities occur during an event commonly known as a co-design workshop (although, depending of course on the circumstances of the project, this may be paired with other activities such as an ideas fair). Members of the public are invited to the workshop – often, a day-long event. As with many participatory activities, broad representation — by age, background, activity — is key, although groups within the broader community may need special consideration. 1. Speak for yourself – say “I” not “We”- let others speak for themselves. 2. Avoid negative criticism – if you don’t like an idea suggest your alternative. 3. Don’t attempt solutions – think of the life of the place, consider possibilities. A co-design workshop often starts with a Site visit and Walkabout, allowing the facilitators and members of the community to jointly learn or re-discovering salient features of the site, like lighting, topography or existing infrastructure. With the atmosphere of the space fresh in everyone’s mind, the public is asked to brainstorm an Activity Timeline. As a group, the public discusses what kinds of activities they envision taking place in the space over the course of a day. I sometimes refer to this as, “A Day In the Life.” This brainstorming serves as an opportunity for people to give voice, in a large-group setting, to how a place would fit into their daily lives. Once all the groups have completed their images, the specific elements that have been included and highlighted in the image are listed. The images are displayed and the larger group is invited to view all the images produced and to express their preferences for the qualities and features in the images, as well as their suggestions for what might make them work or not work in the particular place. This site from the City of Vancouver has three co-design reports for the Woodward’s Project in Vancouver, and can give you a good idea of the output of a co-design process as well as the way a co-design workshop might be coordinated with other community engagement activities. This video is from Stanley King’s work on the Little Mountain Housing Project. It has been edited together by a local community group and provides an overview of the workshop and shows some of the resulting images. (Stanley himself appears 7:53 into the video.) The community’s groups description of the video highlights an important point that is true of all participatory tools — that what happens during a co-design process needs to be integrated and followed-up in a planning and development process. My blog post of a co-design demonstration from 2009 also contains some images of the consensus process where people vote on the features in the images. Here is a photoset of images from an adaptation of the co-design workshop adapted for the City of Vancouver’s Transportation 2040 transportation plan update public consultation activity. Together they created a Co-Design Youth Program to help youth participate in the ecological design of the spaces they will ultimately inherit. Recently, the program has enabled youth to participate in school garden design, architectural design of a waterfront and also in transportation planning. Currently, Stanley and Susan are researching the connection between co-design and the ecological interactions of communities. As you can tell, I’m a big fan of the method, because I think people inhabit a different frame of mind when they are in engaged in constructive processes of making things together in addition to the usual talking, discussing and deliberating. It’s been pointed out to me that it may be challenging to some for relegating planners in a seemingly passive role, of recording and notetaking the public’s interests rather than more actively applying planning skill. I would respond that by hypothesizing that an awful lot happens in those conversations while the artist-facilitator is drawing. Furthermore, I’d be interested to see what role the images created in the process might have in identifying community assets for implementing what is brainstormed, and coordinating that with more formal activities involving developers, architects, designers and planners.